**Due to all the recent changes Facebook has undergone, some of the follow steps may be different. Despite popular belief, growing a successful business isn’t complicated. Business really boils down to one thing – relationships. The more people you move through that process, the more successful your business will become. That’s exactly what the Chamber of Commerce does. They connect you with strangers. Then it’s your job to convert them to friends. Facebook has become the online version of the Chamber of Commerce (on steroids). There are many things you may not know about Facebook, but one thing is certain, it’s a tool you can’t ignore. 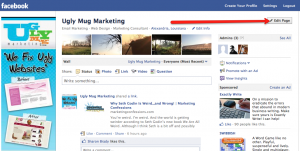 Facebook gives your business the ability to rapidly connect with thousands of strangers. That’s the easy part. Once you’ve connected, now it’s time to go to work. You’ve got to figure out how to turn them into your friend. The first step is getting them to “Like” your Facebook page. This is how you gain permission to continue your relationship (communication) with them. Having people land on your Facebook wall often isn’t enough to convince them to click the “Like” button. Fortunately there’s another way. I’m not going to spend much time talking about the benefits of collecting names and email addresses from your “strangers”, but trust me, it’s crucial to the growth of your business. 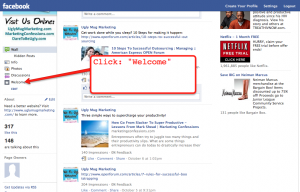 Now let’s walk through the specific steps of creating your very own custom Facebook Welcome page. 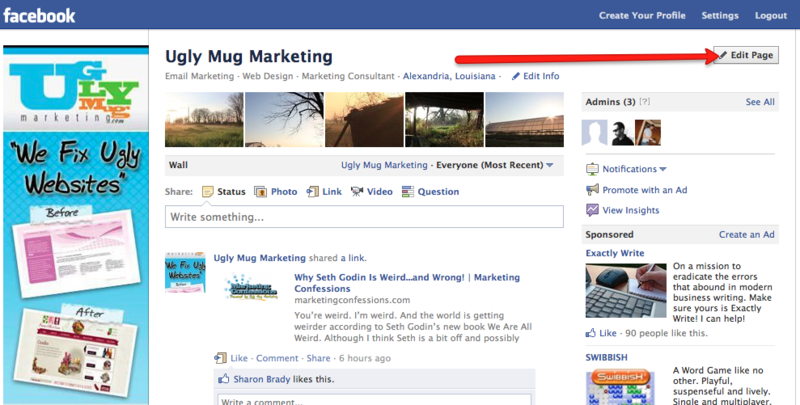 Login to your business Facebook page, and click “Edit Page” on the top right. Click on the “Apps” tab on the left-hand side of the page. This will bring up a list of all the “Apps” you have already installed on your Facebook page. Next, you’ll want to type “Static html: iframe tabs” in the search box on the top of the page. A drop-down list will appear as you are typing. You’ll want to select the “App” titled Static html: iframe tabs (it’s the one with the star as an icon). Now it’s time to add your Welcome page. 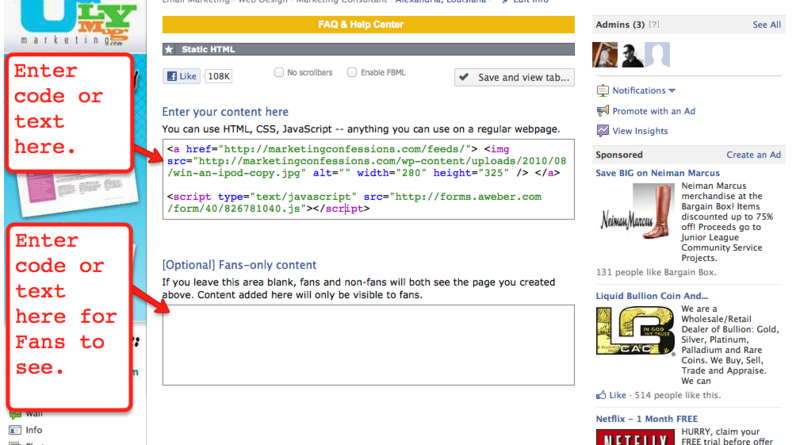 Click the box that says “Add Static HTML as a Page”. 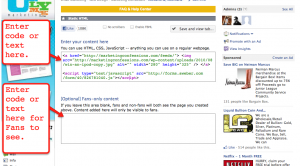 Then confirm by clicking the box that says “Add Static HTML: iframe tabs”. You’ll now be re-directed back to your Facebook Wall. On the left-hand side you’ll see a “Welcome” page. Click on the “Welcome” page. Now it’s time for the tricky part. This step isn’t complicated or confusing, but you will need some basic coding knowledge to do this part. Don’t know anything about coding? No worries! At the bottom of this post I’ve provided links to services (yes, some are free) that make this process easy. 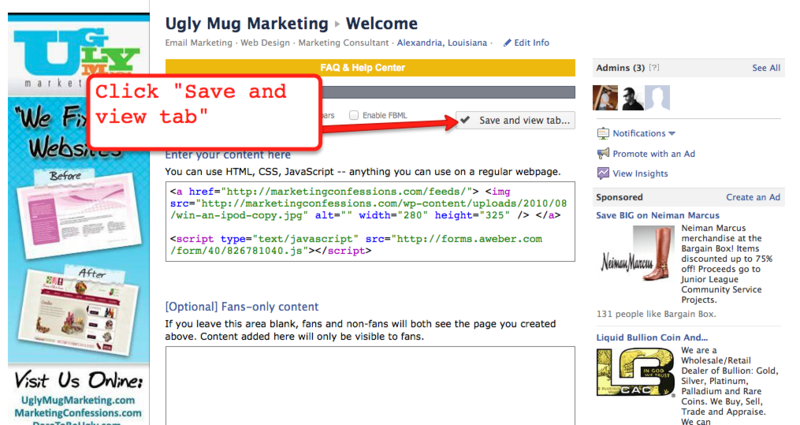 The final step is to click “Save and View Tab”. This will bring you to your new Welcome page. 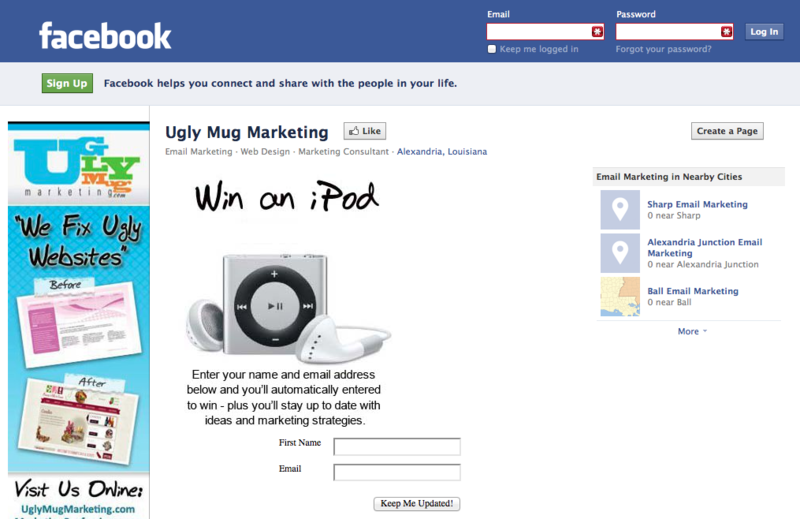 Follow those nine steps (plus a little coding) and you’ll have your very own Custom Facebook Welcome Page. The advantage of using Static HTML: iframe tabs is that the app is 100% free, and they don’t have any of their logos or branding on your Welcome page. But if you don’t code, and you don’t know anyone that does, then the Static HTML: iframe tabs app is useless. Here are a few tools that make it easy for you to add your very own Welcome page – without any graphic design skill, and without any coding knowledge at all. 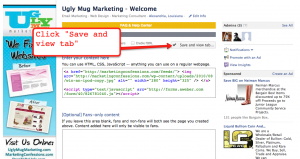 Tabsite offer several different packages, including a free version. The only drawback is they place their logo (it’s really small) on the bottom of your welcome page. Their paid versions start at only $5.00 per month. NorthSocial makes it easy. They include over a dozen special apps with each of their packages – which start at $19.95 per month. Their apps will allow you do include things like videos, photo galleries, optin forms, social media buttons and more, right on your Facebook Welcome page. With Wildfire, you can quickly and easily build and launch social media marketing campaigns. 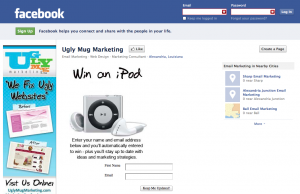 Campaign formats include quizzes, contests, coupons, virtual gifts and more. They provide easy-to-use design features that enable you to create layouts and designs to match your brand. Their prices start at $5.00 per campaign + $0.99 per day. I think you’ll be thrilled with any of these three options. 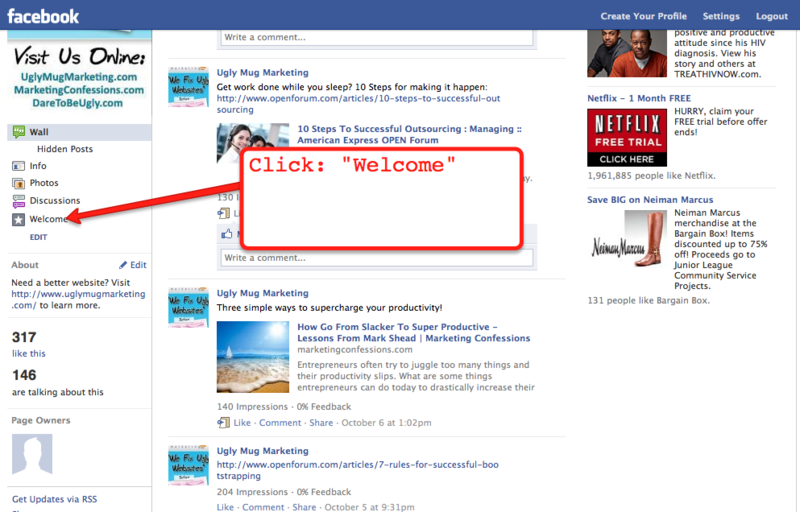 They all do a great job of making it simple for you to customize your own Facebook Welcome page. Any questions, please let me know in the comments below. Also, feel free to share any tips or tools you use to maximize the power of your social media marketing.